This is a photo of a table I created for a former 7th grade student of mine. It laid out his academic future leading up to college. 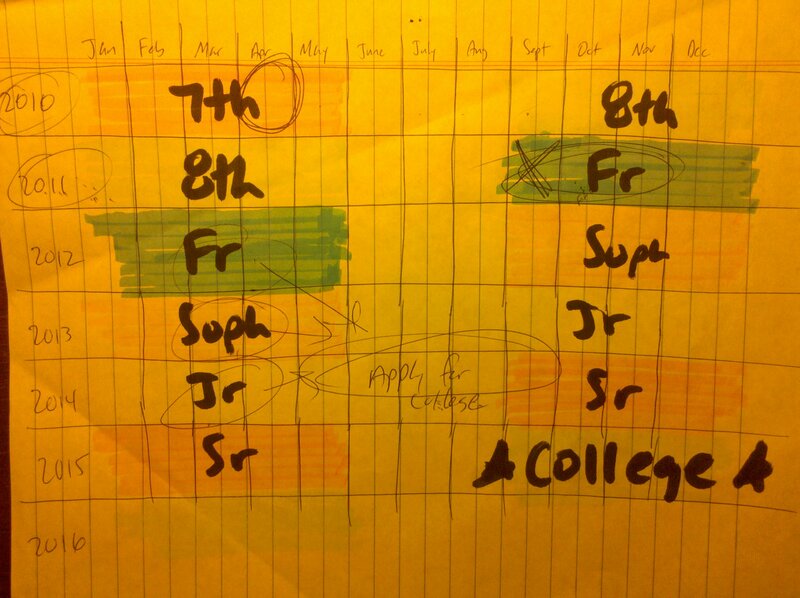 The arrows were a visual part of my explanation of how college applications are largely based on the 9th, 10th and 11th grade high school years. This is significant because many students struggle their freshman year of high school. If they have a bad year academically one third of their courses used to compute their gpa for the application is a drag on the gpa. There are other negative consequences for a bad start to high school such as a diminished confidence, poor study skills, shifting into a lower level academic track and self-fulfilling prophecy. Preparing for college (or post-secondary education in general) really does start in middle school. This is magnified for students with special needs. Training them to be self-sufficient and to self-advocate can take a long time. The longer it takes to start this training the longer it takes for them to become fluent at these self-help skills. As a long time adjunct instructor at various colleges and universities I have repeatedly been witness to the same poor study skills in college as I see in high school and middle school. Huffington Post Education has a story about states considering action to hold school districts accountable for their graduates having to take remedial courses upon entering college. Of course there are many factors that affect a student’s performance in college but high schools can do more to prepare students for post-secondary education or training. The current set of evaluation and accountability measures are actually counterproductive for preparing students for subsequent education and training. SAT scores, graduation rates, standardized testing and grades in general do not measure independent learner skills. Such skills are essential in a post-secondary setting that offers far less support provided in high schools. This could have a major and very positive impact on students with disabilities. In lieu of the current approach of helping a student with special needs pass his or her courses to get a diploma the focus would be on training a student to be a more independent learner with competence in study skills such as maintaining and using a notebook.